This rich and creamy Easy Beef Stroganoff is comfort food at its best!! It’s full of flavor and perfect for a busy weeknight meal. It only takes about 30 minutes from start to finish! Heat 1 tablespoon olive oil and 1 tablespoon butter in a heavy skillet over medium-high heat. Add beef, season with salt and pepper, and cook, tossing frequently, until browned on all sides, about 8 minutes. Transfer to bowl. Reduce heat to medium-low and heat the remaining oil and butter in the same skillet. Add mushrooms, onion, garlic, and thyme. Season with salt and pepper, and cook, tossing often, until mushrooms are golden brown and tender, about 6 minutes. Add broth, cream, Worcestershire sauce, and bay leaf; mix to combine and bring to a simmer. Cook until reduced, about 6 minutes. Return beef to skillet; cook over medium-low heat until sauce is thick and creamy, 8–10 minutes (see notes). Taste and adjust season with salt and pepper, if necessary. Turn off the heat and whisk in sour cream and mustard; mix until well combined. Serve immediately, garnished with chopped parsley, if desired. How do you thicken stroganoff sauce? If you notice that the sauce isn't thick enough to your liking you can add one tablespoon cornstarch mixed with one tablespoon cold water. Be sure to mix well to prevent lumps. Add the cornstarch mixture to the sauce (step 3). 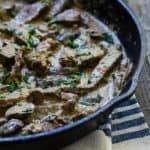 What is best meat for beef stroganoff? To make beef stroganoff is best to use lean cuts, such as top sirloin, tenderloin or boneless ribeye, cut thin into 1-inch wide long strips.